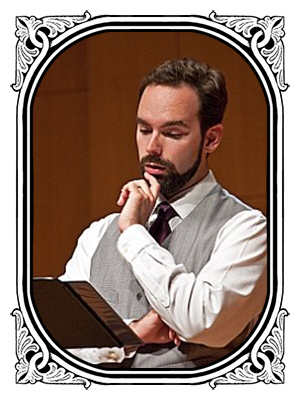 Kyle Siddons, baritone, is a professional singer and music educator in the Savannah, GA area. He has appeared with the Voices of a New Renaissance, Boston Baroque, Boston Secession, the Pennsylvania Sinfonia Orchestra, the Salisbury Singers, the Hilton Head Symphony, and the Savannah Philharmonic, and has worked with the likes of Robert Page, Martin Katz, and Pierre Boulez. On the operatic stage, he has performed scenes from Robert Ward’s The Crucible and Jake Heggie’s 3 Decembers with the University of North Texas Opera Theater, premiered the roll of Enio in Pasquale Tassone’s Seven Rabbits on a Pole at the Longy School of Music in Cambridge, MA, and sang in the joint Savannah Music Festival & The Voice Experience production of Gianni Schicchi. As a passionate proponent of art song, Kyle has performed songs by composers from all eras; from Schubert to Saariaho. He has premiered many new works, worked with composers such as John Harbison and Jake Heggie, and has given the NYC premier of a score by Pulitzer-prize winning composer, Steven Stucky. He is committed to reaching new audiences by designing and performing recitals outside the concert hall to help foster music-appreciating communities. Kyle holds a Doctorate in Vocal Performance from the University of North Texas and additional degrees from the Longy School of Music and the Manhattan School of Music. He works as the upper school music teacher & choir director at the Savannah Classical Academy and enjoys serving as the accompanist for iCantori. Kyle is the father of two young children and loves craft coffee & all things Disney.